Let Us Decorate Your Home And Garden! Our love for flowers, gardening, painting and decorating helps us put that extra special, personal touch on all our creations. Family-owned and operated, The Potting Shed & Flower Shop is a professional local florist proudly serving the Quispamsis, New Brunswick area since 2002. Our friendly and knowledgeable staff is ready to assist you when you need flowers delivered locally or anywhere in the world. We also offer daily delivery service to local hospitals and funeral homes. Let us customize a beautiful and eye-catching flower arrangement especially for you! 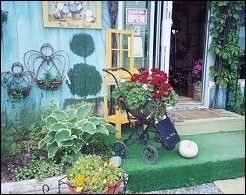 In addition to our shop, we also have a unique greenhouse where we grow our own annuals and garden planters. We can help you plan the flowers for an event that’s a "blooming" success! Call us in advance at 506-832-0099 to schedule your bridal or event consultation. We specialize in corporate arrangements and rentals are also available. You can always depend on our courteous staff to help you send FUNERAL FLOWERS fo r a friend or loved one. We will design and deliver an arrangement that beautifully conveys your feelings of sympathy and serves as a lovely tribute to the deceased. 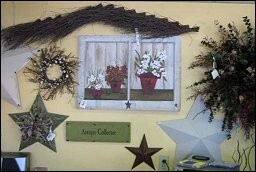 Ask about our living gardens, wreaths, crosses and homestyle sympathy arrangements. Visit our Greenhouse Full of Green & Blooming Plants, European gardens and garden planters for a gift that adds life to any room or office. Our specialty is our custom planters... bring in your containers, window boxes, urns and moss baskets, or purchase some of our unique baskets and planters already filled with your favorite plants. Featuring one-of-a-kind hand painted windows, signs, murals and garden furniture, as well as plush stuffed animals, balloons, decorative silk flowers, dried floral arrangements, twig wreaths & garlands, home décor items, seasonal gifts & décor, rustic items, primitives, birdhouses, etc. Thank you for visiting our website for flowers delivered fresh from your local Quispamsis, New Brunswick florist, The Potting Shed & Flower Shop.